A patch on a police officer’s uniform. EPD announced a decrease in the use of stop and frisk from 2016 to 2017. When Gregory Hall left the Evanston Public Library’s branch near Main Street two months ago, he was stopped by police who mistook him for an armed robbery suspect. Hall is one of thousands who Evanston police have pat down since the department stepped up its use of stop and frisk five years ago. Stop and frisk is a tactic that allows police to briefly detain a person for investigative purposes if the officer has reasonable suspicion that the individual has, is or about to engage in criminal activity. Use of the controversial tactic was upheld in the 1968 court case Terry v. Ohio when the U.S. Supreme Court ruled that officers can stop individuals without probable cause. The practice is used by the Evanston Police Department, but there was an 18 percent decrease in use of the tactic by EPD from 2016 to 2017. Last year, police conducted 881 pat downs, with 13 percent of those stops resulting in arrests. Evanston Chief of Police Richard Eddington said at a City Council meeting on Monday that the department depends on an “intelligence scheme” of a variety of sources to determine when to deploy stop and frisk procedures. Information from community members, outside law enforcement, social media tips and incident report interviews with victims and suspects is verified by an intelligence unit through independent sources. This information is then shared with the department at weekly deployment meetings, Eddington said. Officers are expected to tailor their use of stop and frisk to the specific public safety concerns — like suspect descriptions — discussed at that week’s meeting. EPD reported 1,076 stop and frisks in 2016, according to its website. 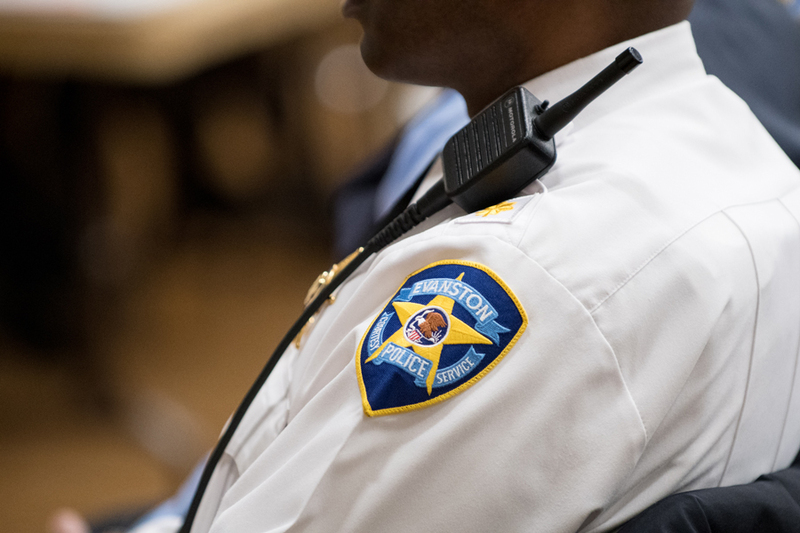 Seventy percent of those who were stopped and frisked were black, while Evanston’s black population accounts for 18 percent of the total population. The Illinois Department of Transportation conducted a study that showed 272 of the individuals stopped and frisked in 2016 in Evanstonwere pedestrians. Black people made up 72 percent of those pedestrian stops that year. Arthur Lurigio, a professor of criminal justice and psychology at Loyola University Chicago, said the practice of stop and frisk has its place in law enforcement as long as it is not used for the purpose of intimidation. Eddington first announced the implementation of stop and frisk in August 2013 to respond to the increase in gun violence. EPD had avoided the controversial tactic in previous years, but initiated it in response to a feud between two rival factions with a history of gang-related activities. Evanston had between one and three murders annually in the 12 years prior to 2012 –– except an outlier in 2010 when six homicides occurred. In September of 2012, Evanston Township High School freshman Dajae Coleman was shot by a resident with a known gang affiliation. The resident mistook Coleman for someone else. The 14-year-old’s death was the city’s first homicide of the year and shocked community members, who remembered Coleman as an excellent student and basketball player with a bright future. Two months later, 19-year-old Justin Murray was killed in what police called a long-standing feud between two gang-affiliated families. Another fatality came in December when 23-year-old Javar Bamberg was shot and killed. Police believed a conflict between the Bambergs and another local family led to the two deaths. The same month EPD announced it would step up its use of stop and frisk, a United States District Court judge ruled that New York City’s stop and frisk policy violated the Fourteenth Amendment’s promise of equal protection. They found that black and Hispanic people were subject to stops and searches at a higher rate than whites. They also said the tactic did not decrease crime. Two years after the New York decision, Chicago civil rights attorney Antonio Romanucci filed a federal lawsuit against Chicago and the Chicago Police Department objecting to the practice, calling stop and frisk unconstitutional. Similar to Evanston, about 70 percent of those stopped and frisked in Chicago in 2016 were black, according to the Illinois Department of Transportation pedestrian stop study. Northwestern political science emeritus Prof. Wesley Skogan said the practice “spiraled out of control” in Chicago and that police were targeting neighborhoods with a lot of crime, but not recovering any guns. Both New York and Chicago saw a dramatic decrease in use of the tactic, but for different reasons. Skogan said CPD made less stops in 2016 because an Illinois law passed that year required a detailed investigatory stop report for each pedestrian stop and frisk. He added officers essentially have to write a more complete narrative justifying why they made the stop. EPD also abides to this law. Illinois law also requires police issue a contact card for every stop made without an arrest. The card includes the race and gender of the person who is stopped, the police officer’s name and badge number and the date, time and location of the stop. The officer also must explain the reason for the stop and if they frisked the individual. Officers wrote 2,034 adult contact cards in 2016, but only 1,542 last year. Black people accounted for 66 percent of the contact cards filled out in 2017, according to EPD data. EPD did not release demographic data on stop and frisk for last year. EPD initiated a violence reduction program in 2015 that focused on stop and frisk. They added two detectives well-versed in gang and drug activity from the special operations tactical team patrol selected areas every night, Evanston police Cmdr. Joseph Dugan said in 2015. The detectives use a heat map that tracks gun activity throughout the city to recover guns off the street. They also targeted areas with known gang members. There are around 10 gangs and approximately 400 documented gang members in Evanston, Evanston police Cmdr. Ryan Glew said. The tactical team made 150 investigative stops and recovered 15 firearms in 2016. Glew said 38 firearms were recovered by the entire police department in 2017. But Glew said police have stopped using the patrol — which sends detectives to selected areas at night — as recently as this summer due to budgetary constraints and seasonal reasons. Ald. Donald Wilson (4th) said at council on Monday that the city should continue to think about how the Evanston community is policed.